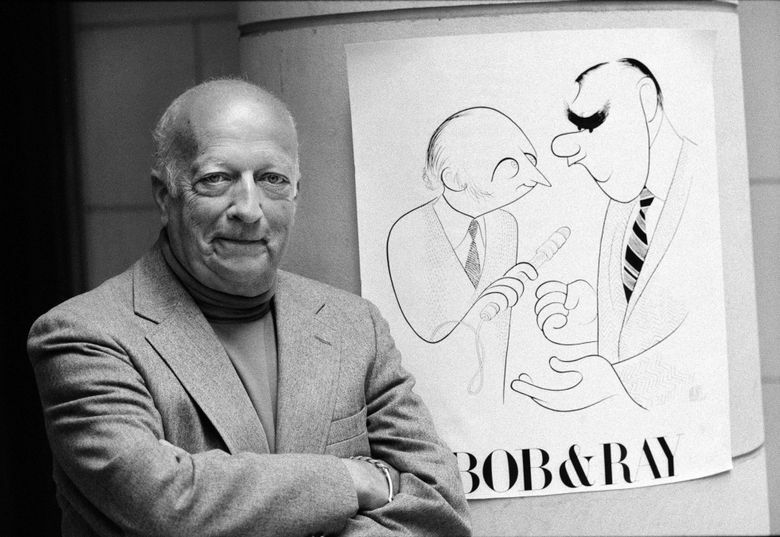 Bob and Ray were masters of subtle, unabrasive satire delivered in two-man sketches featuring an array of colorfully memorable characters. Bob Elliott, the surviving half of Bob and Ray, the legendary radio-comedy team that came to national fame in the 1950s and continued to be a cult favorite decades later, died Tuesday at home in Cundys Harbor, Maine. He was 92. The cause was throat cancer, his son Chris Elliott said. The younger Elliott is a comic actor. Vocally adept comic actors with perfect timing and delivery, Bob and Ray were masters of subtle, unabrasive satire delivered in two-man sketches featuring an array of colorfully memorable characters. Other ersatz advertisements included exhortations on behalf of the Monongahela Metal Foundry (“Steel ingots cast with the housewife in mind”), Einbinder Flypaper (“The flypaper you’ve gradually grown to trust over the course of three generations”) and Height Watchers International. His interview subjects (all played by Goulding) had even more to be modest about than he did. They included a farmer who was plagued with bad luck, even though his crop consisted of four-leaf clovers, and the owner of a paper-clip factory whose idea of efficiency was paying his workers 14 cents a week. After Goulding died in 1990, many feared they would never see or hear Mr. Elliott again, so inseparable was he from his partner. But he continued to work. Among many other characters, Mr. Elliott also portrayed Dr. Daryll Dexter, the world-renowned Komodo dragon authority from Upper Montclair, N.J.; and Harlow P. Whitcomb, president and recording secretary of the Slow Talkers of America. Among those who were influenced by — or simply called themselves fans of — Bob and Ray were Jay Leno, David Letterman, George Carlin, Garrison Keillor, Al Franken and Kurt Vonnegut. Mr. Elliott, an only child, was born in Boston on March 26, 1923, and grew up in suburban Winchester. After graduating from high school, he attended the Feagin School of Drama and Radio in New York City, where he worked nights as an usher at Radio City Music Hall and later as a page at NBC. Returning to Boston in 1941, he became an announcer at radio station WHDH. In the Army during World War II, he went to Europe with the 26th Infantry Division but was transferred to Special Services. In 1946, Mr. Elliott returned to WHDH as the morning disc jockey. Goulding, a fellow Army veteran and Massachusetts native, also worked there. Mr. Elliott was the morning newscaster. Their comedy partnership began simply as on-air banter. “We knew that we were on the same wave length,” Mr. Elliott said in an interview with Nachman. “They had to have that rhyme, and it’s the only reason we’re Bob and Ray and not Ray and Bob,” Mr. Elliott said in a 1973 interview with The New Yorker. In 1951, the two headed to New York City, where they landed their first network-radio show on NBC. Mr. Elliott and Goulding also launched a longtime side career in the early 1950s doing radio and television commercials. Bob and Ray, whose radio show also appeared on the CBS and Mutual networks — as well as New York radio stations WINS, WHN and WOR — opened on Broadway in 1970 with “Bob and Ray — The Two and Only,” in which Mr. Elliott appeared as Wally Ballou and as, among other characters, the president of the Slow Talkers of America, who talked so slowly that he drove his interviewer, Goulding, into a rage. (He was still talking as the curtain fell for intermission — and still in midsentence when it rose again for the second act.) It ran for five months before going on tour. By the early 1980s, Bob and Ray’s gentle approach had largely been supplanted by a louder and angrier brand of comedy. But they were not forgotten — perhaps, Mr. Elliott theorized, because the “hilarity of pomposity” had not gone out of style — and in 1982, they returned to the airwaves with “The Bob and Ray Public Radio Show” on NPR. They remained on the air for as long as Goulding’s failing health allowed. In 1984, they did two sold-out performances at Carnegie Hall. “We get rediscovered every generation,” Mr. Elliott once told the Los Angeles Times. In 1990, Goulding died of kidney failure at 68. They won three Peabody Awards for their radio work and were inducted into the National Association of Broadcasters Hall of Fame in 1984 and the National Radio Hall of Fame in 1995. His marriage to Jane Underwood ended in divorce. His second wife, the former Lee Pepper, died in 2012. In addition to his son Chris, he is survived by another son, Robert Jr.; three daughters, Colony Elliott Santangelo, Amy Elliott Andersen and Shannon Elliott; 11 grandchildren; and five great-grandchildren.